Nouvelle Inc., one of the world's leading providers of compression wear recovery products, offers an expanded line of arm care garments. Arm lifts in women have increased by the thousands in recent years, as documented by the American Society of Plastic Surgeons. Nouvelle specializes in crafting garments to accommodate arm surgeries performed in conjunction with breast augmentation and reduction. New statistical data released by the American Society of Plastic Surgeons reveals arm lifts in women have increased more than 4,000 percent over the past decade. Nouvelle Inc., one of the world’s leading manufacturers and suppliers of compression wear recovery products, has expanded its arm care line to include an array of options for women recovering from arm surgery (brachioplasty), breast reduction (reduction mammaplasty), breast augmentation (augmentation mammaplasty), lumpectomy, and breast reconstruction following mastectomy. Arm Sleeves by Nouvelle Inc.
Nouvelle’s arm sleeves offer healing comfort at its very best. Ideal for velvety soft support and compression during recovery from arm surgery (brachioplasty), breast augmentation, and liposuction. Compression garments also help prevent extreme, hypertrophic scarring in the event of severe, skin damaging burns. They provide excellent relief for symptoms associated with lymphedema, such as fluid retention and tissue swelling. Each garment is hand-sewn using reinforced Nylon/Lycra®, and offered in beige or black. 1. 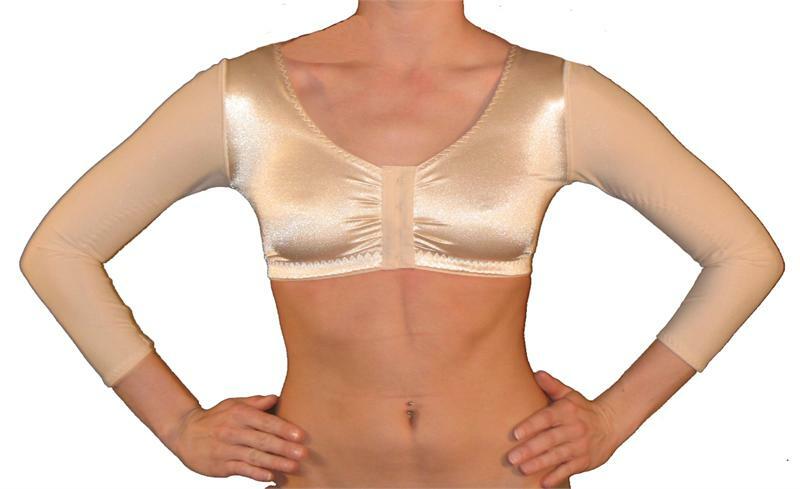 Bra with Sleeves: Complete medical-grade compression for the upper torso. Highly recommended for proper healing following multiple surgical procedures involving the breasts and arms. The bra with sleeves fully covers the back, and provides contouring support for the breasts. Features a convenient front hook-and-eye closure and ¾ length sleeves. 2. Compression Sleeves: High-quality compression recommended for proper healing following surgical procedures involving the arms. Compression sleeves fully cover the tops of both shoulders, and fasten with a convenient Velcro closure. 3. Compression Sleeves/New Style: Superior compression recommended for proper healing following surgical procedures involving the arms. Compression sleeves cover the shoulders, and fasten with a convenient front hook-and-eye closure. 4. Vest with Sleeves: Complete compression for the upper torso. Highly recommended for proper healing following multiple surgical procedures involving the breasts and arms. The vest with sleeves fully covers the back, and provides contouring support for the breasts and upper abdomen/ribcage. Features a convenient front zipper closure and ¾ length sleeves. Nouvelle Inc. offers garments through distributors throughout the United States, India, England, and the Middle East. Its comprehensive catalog covers the full spectrum of healing garments for virtually any type of plastic surgery, ensuring vendors have access to products aligned with latest advances in cosmetic procedures. Each garment is handcrafted with care, and customized for optimal healing of single or multiple surgeries. For more information about international distribution and sales, please contact Dawn Cover via email or telephone.